I've noticed a lot of posts lately--blogs, Facebook, etc.--about Harry Potter. Not just those involving the movie currently in theaters (I'm sure I don't need to remind you of the title), but rather the old debate among Christians about Harry Potter and magic. Mike Duran has a good one HERE in favor of the Potter books/movies. A post with which I wholeheartedly agree (and includes my favorite Stephen King quote ever). "Maybe I am the only hold out in the entire world, but comparing any kind of witchcraft with Jesus is a blasphemy! Christians are deceived by this and the Bible clearly states that in the end times the lie will become the truth and the truth will seem to become the lie. I am so sorry for all of you Christian people who think Harry Potter is a type of Christ. Open up your eyes and be awakened!" Um....okay. I don't know anyone who thinks Harry Potter is a "type of Christ." There's only ONE Christ, right? Not types of Him, eh? Harry Potter may have been used as an allegory for Christ, but that is so, so, so different. He's a character in a novel, folks. JK Rowling may have used him to point to Christ, but that doesn't mean he gets to step in and take the Role. And for the hundredth time--the Bible does warn against sorcery. As in, using the power of demons. Contacting the dead. Divination. (Oh, and btw, divination is made fun of in HP--seen as something of a scam.) In Harry Potter, magic is an ability. 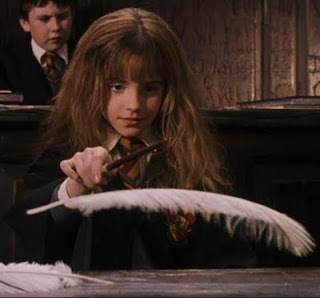 I honestly don't see how anyone can compare levitating feathers with biblical sorcery. If that's the case, then we better not use magnets--did you know you can levitate things with magnets? The magic in HP is nothing more than a different way of doing things. Science, done with words and wands. It warns over and over and over against the use of "dark magic"--which is something that can be compared to biblical sorcery. So, those Christians who gripe about HP are griping against a book that warns against "real" sorcery. All that said, if you are uncomfortable with the Harry Potter novels, don't read them. But you probably won't like my books either. Kat, you may not know that the word "type" used in this context has a different literary meaning that "sort" or "kind". It's like the word "type" means something different when we use a keyboard (typing) or when we "type" blood. This word has many meanings. See dictionary.com #14: chiefly Christian theol a figure, episode, or symbolic factor resembling some future reality in such a way as to foreshadow or prefigure it. In this context, many Biblical figures who are NOT Christ themselves, are called a "type" or "prefigure" or "symbol" of Christ. It is often applied to David and Judah. They show characteristics of Christ. It doesn't mean that anyone thinks David *is* Christ or that he is a classification of christs, only that he had some of the qualities Christ would have, that his kingdom foreshadowed Christ's kingdom, etc. In this context (with the understanding that we are using the word in the theological sense), Harry Potter can be called a type of Christ, because he exhibits many of the characteristics of Christ (willing to give up his life for others, believes that love is the most powerful force, etc). It is very unfortunate that the word has other, more common meanings, and is therefore a confusing Christian-ese way to hold a discussion. Ah, okay. No, I didn't know that. Never heard of it used that way. So, really, this person is not happy with Harry Potter even being used as an allegory for Christ. Fair enough. I still disagree and see no issue with it. But it would have helped for me to know about the specifically theological use of that word before I wrote this. C.S.Lewis,JR Tolkien and many others have used similar symbolism to the imagery that Rowling uses in Harry Potter. Evidently, this fascinating "children's story" will be one of the primary myths of our generation. After all what were all those stories by Horace but myths of a culture.